When it comes to the promotional events industry, many agencies outsource their promotional staffing needs to a third-party supplier. However, few marketeers are aware, that how these outsourced promotional staff get paid, could land them on the wrong side of the law and incur significant fines for non-compliance with HMRC tax rules. Here’s what you need to know and why, when staffing campaigns and events on behalf of your clients this summer. 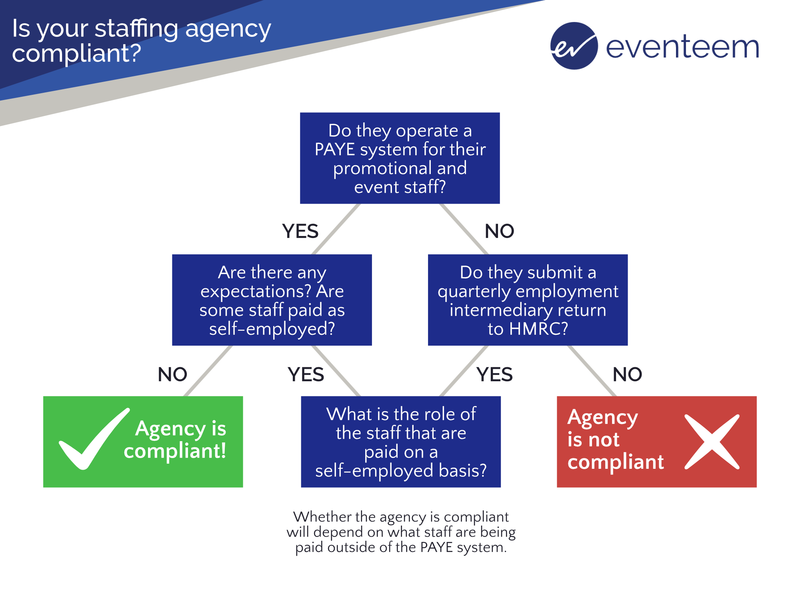 1 Promotional staff MUST be PAYE: under HMRC regulation, event staffing companies are now required to pay employees via the PAYE (Pay As You Earn) system. However, many staffing companies continue to pay their promotional people as self-employed because it’s cheaper and gives them a competitive edge on staffing day rates charged to clients. 2 Cheap is not always cheerful: while using the cheapest supplier might be an attractive option for many brands and agencies, if that third-party supplier is non-compliant with HMRC legislation, it could be formally investigated along with the company that hired its services – YOU. 3 Guilty by association: what many agencies don’t realise is that under HMRC rules they are the intermediary because they hold the contract with the end client. Intermediaries have a reporting requirement under HMRC rules whereby they have to submit regular reports to HMRC identifying any staff that have been paid as self-employed and the reasons why. Non-compliance with this reporting procedure carries hefty fines of up to £1,000 for repeat offences so agencies need to be aware of their liability when choosing their staffing partner. Why first impressions count in the promotional industry. As eventeem’s founder, Ceri’s role is primarily to drive growth, ensuring that agency services remain agile and responsive, continually changing and adapting to support client requirements, ensuring that quality is maintained as the agency grows.